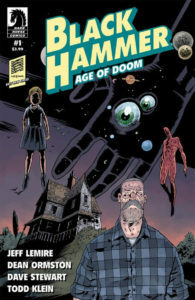 Black Hammer: Age of Doom #1 is a continuation of Dark Horse’s Black Hammer series written by the prolific Jeff Lemire. Black Hammer takes place after a group of superheroes, long past their glory days, have found themselves trapped in an alternate dimension where they must hide their real identities and conform to the world around them. Lemire peppers in some heart-wrenching backstories in this character-driven comic. When Black Hammer #13 ended on that massive cliffhanger of Lucy taking up her deceased father’s mantle and becoming the new Black Hammer, I had no idea when we would come back to the Farm and figure out the mystery surrounding Colonel Weird, Talky-Walky, Barbalien, Golden Gail, Madame Dragonfly, and Black Hammer. But after multiple spin-offs, the gang’s all back to solve those unanswered questions. Black Hammer: Age of Doom #1 picks up right where the original Black Hammer series left off. Lucy is about to tell the group of aging heroes why and how they ended up in this strange prison when she pops out of existence. The group immediately formulates a plan to find Lucy and figure out a way to get the hell out of their situation. Jeff Lemire doesn’t miss a beat in his storytelling for this issue. He immediately puts us back into the mystery that is Black Hammer and makes the reader excited to see where this tunnel leads. I enjoy the parallel storylines of Lucy and the other heroes, with both sides trapped in different dimensions, trying to find their way out. Lemire’s writing is, as always, well complemented by Dean Ormston’s illustrations and Dave Stewart’s colors. Ormston’s art has been gorgeous throughout the entire run of Black Hammer. His beautiful character designs, along with an incredible talent to draw new locations that jump off the page, make reading Black Hammer a fun treat. When Lucy arrives in the Anteroom, and the monsters, misfits, and delinquents come into the bar, the scene is a showcase of how lovely Ormston’s artwork is. Each monster has its own personality, giving this ragtag group a sinister vibe. But the addition of Dave Stewart’s colors gives this scene, in particular, a fun pop. The gradient green of the Zombie, in contrast to the pale white woman with the doll mask juxtaposed over a sizeable dusty brick-red demon in the background, gives the scene depth, beauty, and intrigue all at once. Black Hammer: Age of Doom #1 by Jeff Lemire, Dean Ormston, and Dave Stewart is a beautiful continuation of a fantastic tale. If you haven’t read Black Hammer, I highly recommend you head to your nearest local comic book shop and pick it up. It is a brilliant story about loss, identity, love, and growing older. Age of Doom is an excellent start to diving back into the world of Black Hammer, and I can’t wait to read more.